Have You Been Over To Nate's Virtual Sketchbook? We've teamed up with our good friends at The Secret Files of Fairday Morrow to bring you Nate's Virtual Sketchbook thanks to the talent of illustrator Jessica Haight. 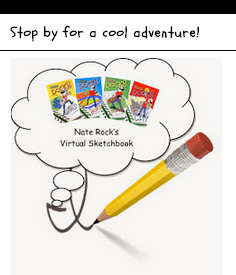 Stop by Fairday's Blog to see Nate's adventures come to life!